As previously reported, the Department of Justice is currently facing off in court against a federal judge from the State of Texas, who has accused federal prosecutors of misrepresenting, and withholding information in federal court, related to the implementation of the expanded Deferred Action for Childhood Arrivals (DACA) program and new Deferred Action for Parents of Americans and Lawful Permanent Residents (DAPA) program that was scheduled to take effect on February 18, 2015, as part of President Barack Obama’s executive actions on immigration. All of that changed, when Judge Hanen filed a temporary injunction in court, blocking these executive orders from taking effect, just days before February 18, 2015. Judge Hanen is asking the court to punish federal prosecutors working for the Department of Justice by forcing them to attend mandatory ethics courses. In addition, Hanen has requested that the Department of Homeland Security hand over the names, addresses, and other information of individuals who were unlawfully granted immigration benefits under these programs. On Friday, a group of undocumented individuals came forward, asking an appellate court to respect their privacy by not turning over their personal information to the State of Texas, and other interested parties. This group of undocumented individuals is currently being represented by the American Civil Liberties Union (ACLU) and the National Immigration Law Center (NILC). Attorneys for the group are expected to argue before the U.S. Court of Appeals for the Fifth Circuit in order to block Judge Hanen’s order. Judge Hanen argues that attorneys for the Department of Justice misled him in federal court by stating that the Obama administration was not taking action to enforce expanded DACA and DAPA. The Judge discovered that the administration was in fact taking action and that approximately 100,000 three-year renewals of deferred action were being processed by USCIS unlawfully. You may recall that in early 2015, USCIS issued a statement asking for the recall of three-year employment authorization cards (work permits) that were accidentally issued to initial DACA recipients after the February 16, 2015 temporary injunction was in place. 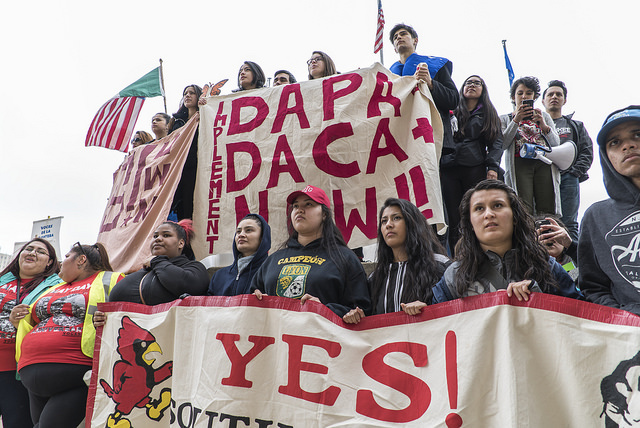 Many DACA recipients seeking renewal of their status, received three-year employment authorization permits unlawfully. Hanen’s order is targeting these individuals, requesting that their information be made available. The Department of Justice is appealing to the U.S. Court of Appeals for the 5th Circuit asking the Court to vacate Hanen’s orders to sanction prosecutors and his request to turn over the personal information of undocumented immigrants who received the three-year employment authorization permits by mistake. The Supreme Court is currently deliberating in the case United States v. Texas, challenging President Obama’s expanded DACA and DAPA programs. A decision is expected this summer. For more information on this issue please continue to visit our blog. For more information about the 2014 executive actions on immigration click here.